There’s nothing like a big Election Night victory – when an investment of time, money, and lots of hard work pays off and you know that the country will be better for your efforts. 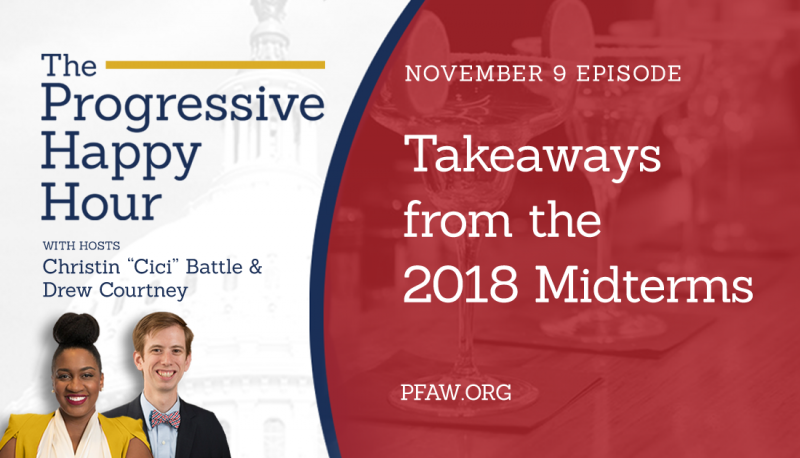 This week, PFAW members, activists, and staff, as well as the entire progressive movement, had several – including two really big ones. Let’s start with one that is incredibly special to all of us in the PFAW family. Andrew Gillum – the Mayor of Tallassee and truly one of our own, as a longtime staff member – won the Democratic primary for Florida governor in an absolutely stunning upset that pundits and political reporters will be talking about for a long time to come. Andrew is the past national director of the Young Elected Officials Network, a program of PFAW’s nonpartisan affiliate People For the American Way Foundation, which was founded in 2005 with the mission to unite and support elected leaders ages 35 and under who share a passion for building communities that reflect values of freedom, fairness, and opportunity for all. 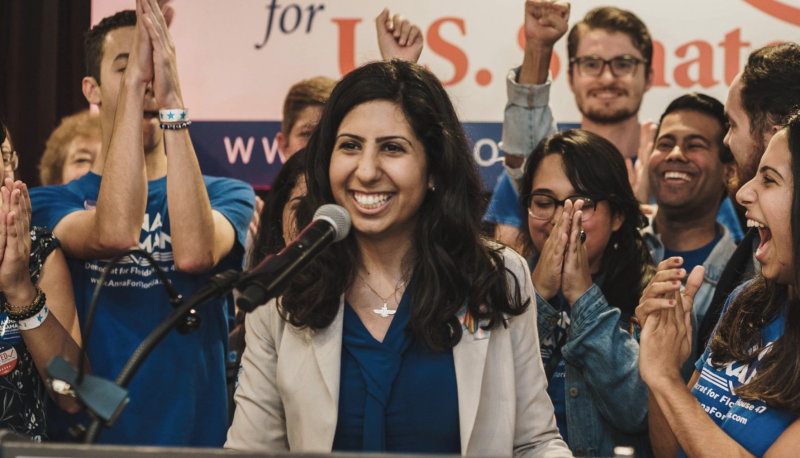 Since then, the YEO Network has grown to include more than 1,200 elected officials across the country in offices ranging from local school boards to the United States Congress. It was truly amazing to see and be a part of and for PFAW to be with him last night in Tallahassee. 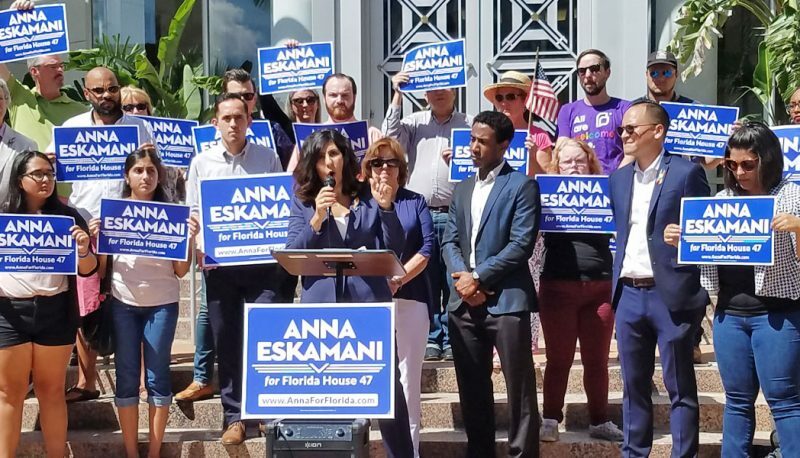 And, should Andrew win the general in November, the impact on Florida politics – as well as the country as a whole, because of Florida’s undeniable national importance – will be earthshaking in the best way possible. Florida hasn’t had a Democratic governor in 20 years and you all know the critical importance of Florida in every national election. Andrew was PFAW’s very first 2018 endorsement. We did everything we could to elevate his profile both in Florida and nationally – similar to what we did with our other exciting progressive endorsees for governor, Stacey Abrams in Georgia, Paulette Jordan in Idaho, and David Garcia in Arizona, who also won his primary last night! Additionally, our “Hurricane of Change” ads featuring the legendary Rita Moreno ran in Florida to help mobilize Puerto Rican voter participation, which we’re confident benefited Andrew. Andrew, who becomes the first person of color major party nominee for Florida governor — and, in November, could become the first African American governor in that state’s history — was the only non-millionaire/billionaire in the race. Polls and pundits said that he didn’t have a chance. He had less name recognition, a small fraction of the money of his competitors and was not like any Democrat nominated in the past. Even in the final two weeks, when there was a surge of energy for Andrew, the pundits said that he might have broken into top tier of candidates. 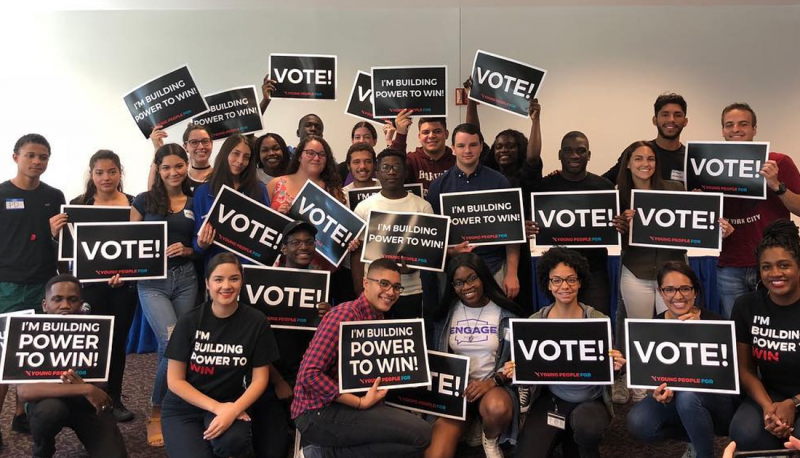 His surge came because of the strength of his grassroots, people-powered campaign and a powerful progressive message that attracted a diverse coalition of voters, including many first-time young voters. 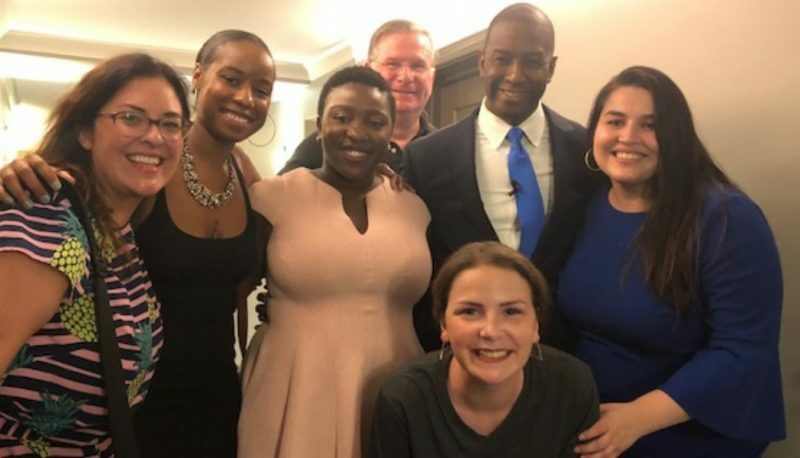 Andrew Gillum’s historic come-from-behind win in Florida really helps prove PFAW’s values and long-term investment in young leaders and building a deep progressive bench at all levels of government – something the Right did 30 years ago that led to their electoral successes and created a massive barrier to progress … until now, that is. Andrew, only 39 years old, is endorsed by PFAW’s Next Up Victory Fund, which helps young, diverse progressives win state and local elections. Our ads in this race in large part targeted Latino voters as part of PFAW’s Latinos Vote! program, which exposes and counters anti-immigrant, anti-Latino rhetoric and policies. We’re getting out the Latino vote to win important elections that are changing America. Everyone at PFAW is still buzzing with excitement and no doubt will be for days to come. We can’t wait to help this history-making, transformational progressive champion Bring It Home in the November general election against Trump-endorsed right-wing Republican Ron DeSantis. At a time when the president continues to drag our national conversation into the gutter — uninterrupted by a feckless GOP Congress — Andrew will stand up to Trump and become an important leader in the Resistance. Now onto the other big victory, which came a bit later in the night, for a PFAW endorsee for governor: David Garcia in Arizona. David is an education professor and a true innovator in the field, as well as an all-around progressive champion and a fighter for working families. He was another early PFAW endorsee and if elected in November will be Arizona’s first Latino governor in more than 40 years. His election would represent another seismic political shift in a state of significant – and increasing – national importance that has long been dominated by conservative Republicans. In February at the National Press Club, in a first for PFAW, we did a joint endorsement announcement event for Andrew Gillum for Florida, Stacey Abrams for Georgia and David Garcia for Arizona, all big, important sunbelt states with complete Republican trifecta control of their states. We said that day that the big, surprising story out of the 2018 election may just be the governorships won by strong progressives in key states. Providing a check on gerrymandering after the 2020 census alone will be a national game changer. All in all, it was an incredible night and it wouldn’t have been possible without the contributions – financial, volunteer, and otherwise – of PFAW supporters like you.